For many of us across the United States, it may still look and feel like winter with snow on the ground. Even here in the south, I’m covering my Clematis and Peony bushes while praying that we will see our last freeze or frost warning of the season soon. Our fickle spring weather may be keeping us from working in our gardens, but we can use this time to get our gardening tools in order. It’s time to clean those shovels and trowels and replace any worn tools. 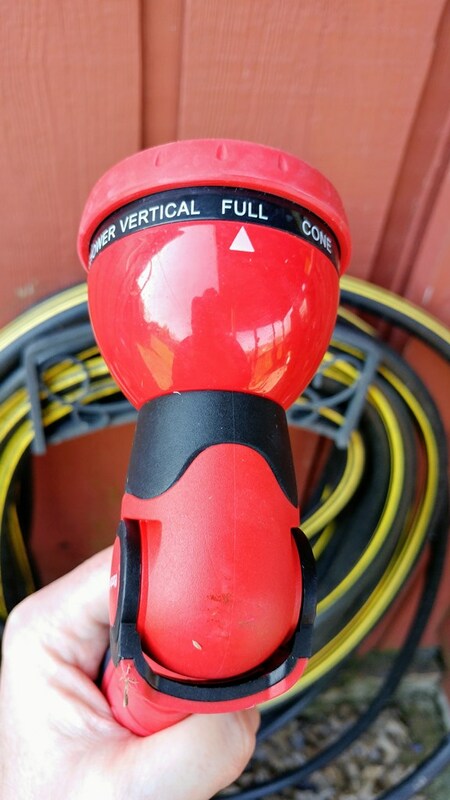 Here in my garden, I’m starting the growing season with a new garden hose nozzle sprayer from Gardenite. This is a sponsored post on behalf of Gardenite. I received information to facilitate my review as well as a promotional item to thank me for my participation. When warm temperatures arrive, it doesn’t matter whether you’ve got a half acre filled with vegetables, are growing beds full of flowers and herbs, or dabbling in container gardening; watering is a mandatory chore for all gardeners so if a nozzle can help make this a more pleasant experience I’m all for it! Does the nozzle drip at the connection to the hose? How strong and far-reaching is the highest spray setting? How gentle is the shower feature? How well does the triggerless thumb control work? I’m happy to say that the Gardenite Garden Nozzle Hand Sprayer past my tests with flying colors! Question 1 answer: There was a little leak at hose connection at first, but I just needed to tighten the nozzle sprayer a little bit more and that issue was resolved. Question two answer: The nozzle set on full gave me a strong burst of water, which will come in handy for getting rid of mud and debris off boots, sidewalk and garden tools. It’s also far-reaching, so I’ll be able to water all the way to the end of my flower bed without rolling out the hose fully! Win! I have a lot of containers with flowers and herbs in my garden almost year round, so I need a light, gentle spray of water that won’t lop off my blooms. 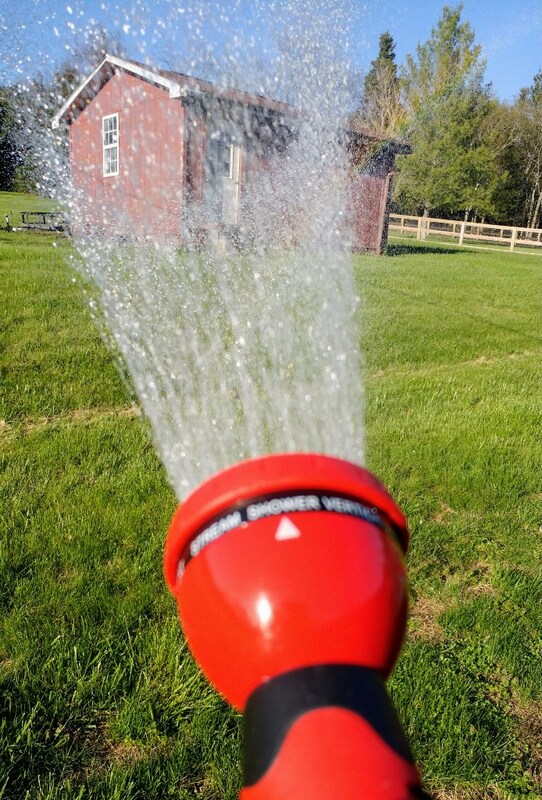 I usually use the shower feature on garden hose nozzles, and this feature on the Gardenite nozzle is just right because I can make the spray as gentle as I need by turning the top indicator to the left. When I need more pressure, I simply turn the indicator to the right until the correct pressure is achieved. Thumb fatigue is a real thing, just ask any gardener! 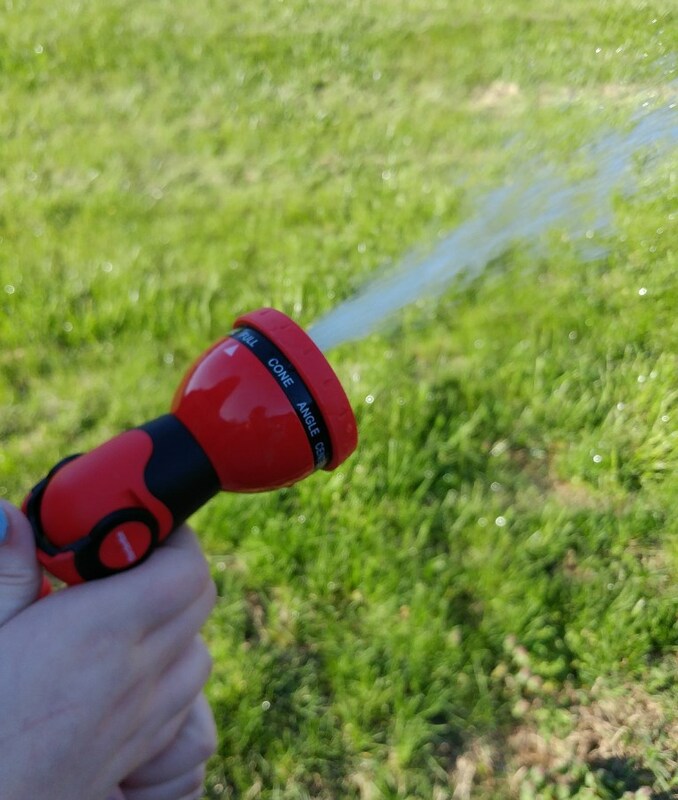 Having to apply constant pressure with your thumb to water with regular hose nozzles can leave your hand feeling tired and cramped, I was excited to see that the thumb control on the Gardenite nozzle works like a dream! One click up- water is on. Click down- boom-off! Easy Peasy watering at its best! No thumb cramps here. See it in action below! 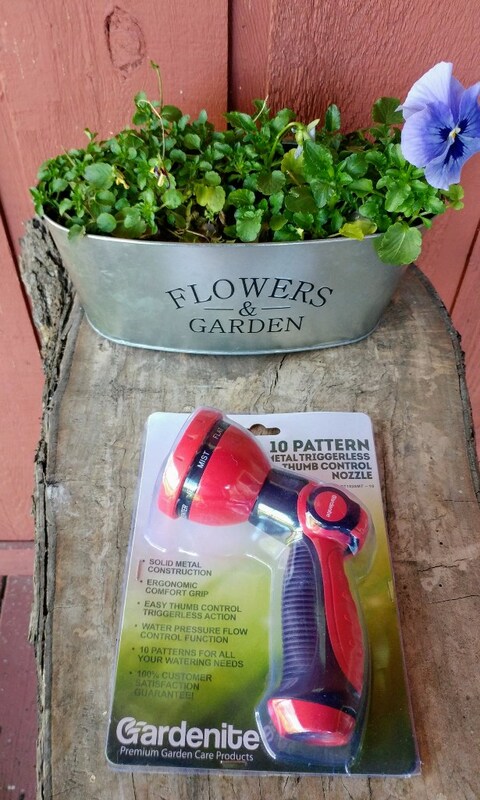 You'll never get a thumb cramp while watering again with this triggerless hose nozzle! Gardenite has put a lot of thought into this gardening must have. #ad Stop by the blog today and enter to win it! Link in bio. 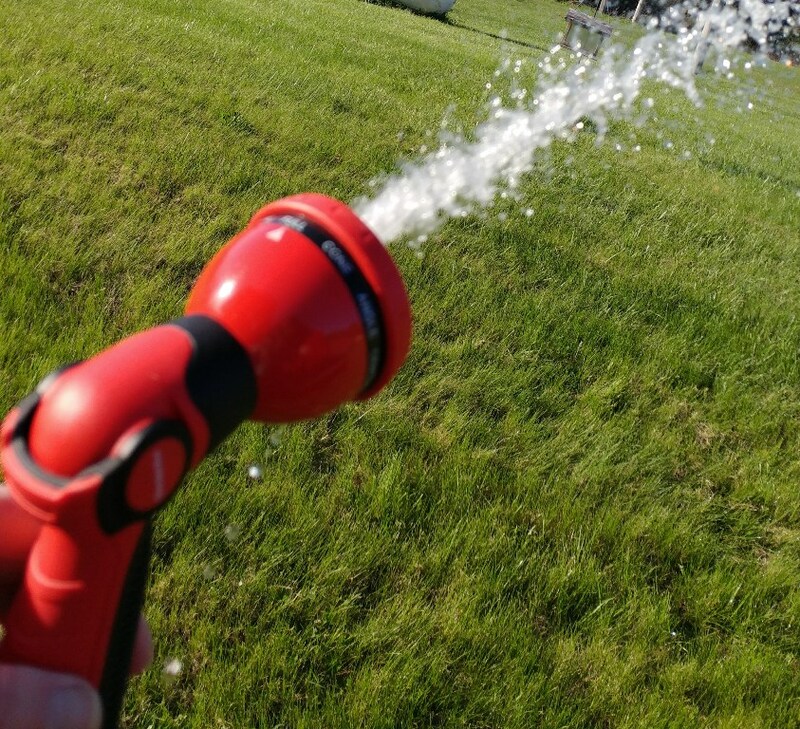 You may be thinking all hose nozzles are pretty much the same, but trust me, when the dog days of summer get here and you are sweating while watering first thing in the morning, you’ll thank yourself for getting this easy to use nozzle, ergonomically designed hand sprayer. You can learn more about how it’s made the 12-month warranty and purchase it on Amazon here, or you can enter to win one! Thanks to today’s sponsor, Gardenite, one lucky winner will receive the Gardenite Garden Nozzle Hand Sprayer! Entering is easy using the Gleam form below. Please share in comments: What type of gardening do you enjoy? We awoke to frost this morning. I know you are still getting snow in your area so I won't grumble too much about frost. But I will say, spring-like weather needs to take over now!